from the Wikipedia entry for "villain"
" in such an impasse, common sense all but dictates we move in favour of rights (IOW, no ban), but such a thing seems unacceptable to the anti-gun side, such as when they pushed for your Hughes Amendment." " Emotionally, it is a no brainer--Machine guns are about as scary as it gets, and it is pretty hard for a civilian to claim a legitimate 'sporting need'. But there was not a problem with legitimately owned machine guns. As far as I have been able to find out, there have been only 2 machine gun crimes committed by legal owners since the NFA was enacted in 1934. 2 crimes in 50 years is evidence that the system prior to the Hughes amendment was adequate, not that it needs to be tightened further. " " Why ban something which is virtually never used in crime? Machineguns, assault weapons, hgh capacity magazines, etc...all scary, but virtually unused in crime when/where legal. Most "gun crimes" involve 1-2 shots with a handgun. " 6. imposes harsh penalties for machine gun violations, including imprisonment of up to 10 years, a fine of up to $ 250,000, or both for possessing an unregistered machine gun." Incredibly, here is a link to a site that argues for repealing the Hughes Amendment. From the linked site, above: " It's a new decade of the 21st century. It's time to get out there and make a difference. We have weakened many of the gun grabbers out there, and it's necessary to go even further when they're even more vulnerable. Time for the NRA and the armed citizen to prove a point, get out there, and get our rights back". And that is what this back and forth "arguing" is all about. A wish on the part of the NRA and its' extreme members to get more of what they want while they think I and those who work with me are vulnerable. These are not honorable intentions. "And personal tragedy does not excuse ignorance." "so you're either being obtuse or intentionally dishonest. " " Why are you so angry? Why are you so disrespectful towards all of us and towards our rights? Perhaps grief counseling might be a good idea for you? It can be tremendously helpful when you've lost a loved one. " " The kind of bigotry and outright dishonesty you display on this blog with each post deserves to be exposed at every opportunity. People are not kind to bigots like yourself, nor should they be. " "My fear is that for all your good intent (and I DO believe that your intent is well-meaning), you simply don't know what you're talking about. You haven't lived in the gun culture and you've been scared into believing what you do. Like Rep. Carolyn McCarthy who thought a barrel shroud was "a shoulder thing that goes up", most anti-gun people are shockingly ignorant about the reality of firearms laws and operation." "I have to say that what they say about this blog is true. It is reactionary, based upon false assumptions, copious amounts of misinformation, blatant propaganda, and most of all, factual ignorance." "You are a villain, Joan. And a Stupid one at that.Also note that no matter how hard you fight, you will lose, because you are alone in your bigotry." " Good. Ignorant bigots like yourself should be vilified at every opportunity. " A bigot -(from the Wikipedia entry for the word): " A bigot is a person obstinately or intolerantly devoted to his or her own opinions and prejudices, especially one exhibiting intolerance, irrationality, and animosity toward those of differing beliefs. The predominant usage in modern American English refers to persons hostile to those of differing race, ethnicity, nationality, sexual orientation, various mental disorders, or religion." 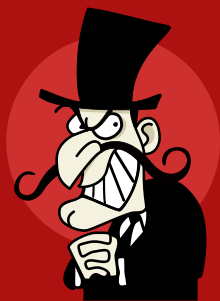 And the definition of a villain is from this linked definition ( also from which the cartoon above comes): " A villain (also known in film and literature as the "bad guy", "black hat", or "heavy") is an "evil" character in a story, whether a historical narrative or, especially, a work offiction. The villain usually is the antagonist, the character who tends to have a negative effect on other characters." Oh yes, I forgot to include that I am also ignorant ( and they, of course, are not.) As I said before, so be it. The old "pot calling the kettle black" comes to mind. I would venture to say that not one person who knows me would use the terms, above, to describe me. Feisty maybe. And assertive and persistent in my advocacy as well. Most would call me energetic, involved, community activist and volunteer, caring and reasonable. Or so I have been called by people with whom I work and volunteer. When I served in elected office, that is how I operated and that is how I was viewed. I have been told that I have integrity and do not have a private persona different from my public one. What you see is what you get. So there we have it dear readers. Common sense is being attacked by Internet bullies who apply stealth tactics to intimidate, call names and accuse. I rest my case. Why should only the rich have machine guns? "Oh yes, I forgot to include that I am also ignorant ( and they, of course, are not.)" Have you ever taken a class on how to defend yourself with a firearm? Something from Gunsite, Thunder Ranch, Suarez International, Massad Ayoob, John Farnam or someone like that? Are you saying that I will need to defend myself? If so, from whom. I need to know what that means, Chris. To the comment about only the rich having machine guns..Huh?? "Are you saying that I will need to defend myself? If so, from whom. I need to know what that means, Chris." You complained that commenters on this blog were calling you ignorant. Rather than just throwing around accusations of ignorance, I'm asking whether you've made any efforts to educate yourself about what self-defense with a firearm is really like. The Hughes Amendment only prevents the transfer of post 1986 machine guns. Pre '86 are still legal to sell. The rest of the stuff you quote is part of the National Firearms Act of 1934. I think a good start would be to drop the Hughes amendment and restart the transfers. Also included in NFA are short barrelled rifles, short barrelled shotguns, and sound suppressors (silencers to you). There is a serious case to be made that the ATF deliberately misread the Hughes Amendment and closed the registry. One of the beauties of the internet is the opportunity to attract people to the idea that they can own an NFA item. Ther are a lot of silencer shoots and machine gun shoots (events). Look up the Knob Creek Machine Gun Shoot. Once people realize what is possible, more people will want to buy these items. It's a great time to be a gun enthusiast. And what, exactly, are the possibilities? What do you plan to do with your machine gun if you are able to buy one? Prices are in the many thousand dollar range for any class 3 firearm. very easily $15,000 for one that the semi auto version is only $1,000. Because there is no way for the numbers to go up for us civilians the whole supply and demand thing took over. not to mention the $200 tax when originally implemented could be something like 8 to 10 times the value of the firearm registered. I would shoot it. At least occasionally. Why, what did you think I would want to do with a machine gun. I'm more interested in the sound suppressors (silencers). I don't see any reason I should have to risk my hearing in order to go shooting. Strangely, in many European countries, guns are tightly regulated but the sound suppressors are cheap and easily available. It's considered rude to disturb the neighbors with gunfire when you are hunting. So, it appears that it would be just fine with some of these guys if more ordinary citizens could own machine guns, unfettered by regulations. I haven't seen a serious call for machine guns to be available unfettered by regulations. Repeal of the Hughes Amendment would eliminate only the requirement that the particular machine gun be registered prior to 1986. Ownership would still require permission from the ATF, (which in turn requires permission from local law enforcement) the federal background check, the $200 tax paid every time ownership changes, permission every time you take it out of state, registration, plus any local or state requirements. Plus all the laws that apply to other guns. Not quite unfettered by regulation. We had 50 years history of machine guns under the NFA before the Hughes Amendment was enacted. Is there something in that history that I'm missing, something besides fear and emotion that justified even more restrictions? Only the rich--Because of the Hughes Amendment, the cheapest legal machine guns are around $4000, for a gun that retails around $300 in a semi-automatic version. Higher quality guns are similarly expensive compared to either their semiautomatic or military/police only versions. While I think we should repeal the Hughes Amendment, I do not particularly want a machine gun for myself. I'm going to go out on a limb and say he plans to shoot it at ranges? That's what people who have them do. Plenty of people legally own them, even (maybe especially, because of income levels and high cost) in the more liberal coast states. It's legal in all but a handful of states. Such guns are pretty much never used in crime in the US. MR. GURA: Well, my response is that the government can ban arms that are not appropriate for civilian use. There is no question of that. MR. GURA: That are not appropriate to civilian use. MR. GURA: For example, I think machine guns: It’s difficult to imagine a construction of Miller, or a construction of the lower court’s opinion, that would sanction machine guns or the plastic, undetectable handguns that the Solicitor General spoke of. Gura concedes that Machineguns "are not appropriate to civilian use." Let me go out on a limb and suggest that if machine guns were widely available and particularly sold by private sellers to anyone without background checks, we would see them used in crime. The main reason we don't see them used in gun crime is because they are rarely available. In fact, I would make bets that machine guns would definitely be used in gun crimes just as assault weapons are now routinely used in gun crimes since the AWB was allowed to lapse. "I would make bets that machine guns would definitely be used in gun crimes just as assault weapons are now routinely used in gun crimes since the AWB was allowed to lapse." I'm guessing that you have not done any research beyond reading Brady handouts in order to define "routinely." Routinely seems to mean, in reality, every once in a while. They are rarely used. It might be helpful for you to think about this in terms of the long fight to extend the 1st Amendment to where we are today. It took a long time to get from the Schenck v. United States to Citizens United v. Federal Election Commission. It may take a while to go from Heller to something approaching the freedoms we had in 1933. Did you know that in 1933 it was completely legal to order machine guns by mail order? What stopped the purchase of machine guns was never the registry. It was the $200 cost of the tax stamp. The stereotypical "gangster" gun, the Thompson Submachine Gun was considered wildly expensive at $175 in 1926. The tax stamp more than doubled the price of a weapon that was already very expensive. You could buy a brand new Ford for $400. The thing you are all missing here is that we don't have to rely on the Supreme Court to strike down these laws. We could just repeal them. All it takes is votes. We just need to get people to stop pretending that background checks and a government sheet of paper are effective at keeping guns out of the hands of criminals. Once people as a whole start to realize that the whole NICS check, GCA '68, NFA kabuki dance just hassles us and not the criminals, they will insist that the laws be changed. The days of a small group of opinion leaders in the media (print or TV) telling us what to do are over. We enthusiasts can reach them directly and cut through the lies and distortion. I think it would be a good idea to go back to the days of the "mob" and the machine guns shooting up people in restaurants and bars. Those were the good old days, weren't they? Umm shoot it. Just like I do my other guns. The Hughes amendment did nothing but keep guns out of the hands of law abiding citizens. How? by freezing supply. Freezing the supply ensured that prices would rise to stratospheric levels and would make such firearms unattainable to most of us. Of course that's the whole point of the Amendment, just like most gun control. It has nothing to do with public safety and everything to do with denying rights. The Hughes Amendment was highly successful in that regard, as is the 1934 NFA laws. Hell, my State bans all NFA items, so even if I jumped through the Federal NFA hoops I STILL couldn't purchase a suppressor for my .22. What logical reason do gun control advocates have for banning supressors?
" Why ban something which is virtually never used in crime?" Indeed! Why can't I own hand grenades and atomic bombs? They are virtually never used in crimes. In fact, forget the "virtually," they are never used in crimes! Why can't I own them? I'm not a gun owner and I don't know if I could hit a target with a regular gun. Based on that, I think I should be allowed to use hand grenades. Another idea might be allowing me to put land mines around my house to convince burglars this is the wrong house to pick. Guns in restaurants make some people nervous, but imagine how calm everyone would be if I walked in a with a few hand grenades. I mean, hand grenades are never used in crime, are they? I believe hand grenades would be easier to use for those with arthritis and other ailments that make it hard to pull a trigger on a gun. It's high time that we recognize that hand grenades are arms covered under the Second Amendment. Who told you that you couldn't own a hand grenade? They are classified as "destructive devices," and require the same paperwork to own as machine guns. There are certain problems associated with using them for personal defense. (A slight understatement!) There is no law against building your own. You should consult with a good NFA lawyer to insure that you are in compliance with the federal, state and local laws. Nukes are much more difficult. No one is obligated to give you a design for the weapon, and most fissionable material is under the direct control of a government. I think that with the serious drawbacks of nukes as personal protective items (another understatement) coupled with the extreme expense and difficulty of manufacturing, you'd be better served just learning how to shoot a gun. Where do you live? I might have a suggestion on where to look for a good teacher. It's not really that hard a skill to learn. Sean- are you serious here? If so, I think maybe you should be reported to local law enforcement. Reported for what? All the info is accurate. 1. Grenades are legal, but require a lot of NFA paperwork to possess. 2. Building them is legal, but requires a lot of NFA paperwork. 3. Get a lawyer, it's a complicated legal subject. 4. Even if you jump through all the legal hoops successfully, grenades are not a good choice for personal defense use. 5. Whatever the legal status of nukes are, they would be too expensive, too complicated, and innefficient as personal defense. It's also damned rude to blow up your neighbor's house to stop a home invasion. 6. Learning to shoot isn't hard, I may know of a reputable trainer in his area. I imagine that you could tell the cops all of this if you like, but they will just agree with me. The emotional response to private ownership of machine guns would be reasonable if we didn't have a history to go by. Machine guns have never been totally banned--from 1934 to 1986 civilians could register new or newly-imported machine guns, and from 1986 on those already registered could be bought and sold. You keep neglecting to mention that repealing the Hughes Amendment would leave us with the successful pre-1986 registration rules, where legal owners of machine guns were nearly perfect. 3) The numbers show that none of the laws reduced crime. If violent crime was running about 15/100,000 for ten years before the law, it kept on at that rate after the law. If it was increasing 0.1%/year, it kept on increasing at that rate. This isn't hypothetical; it's what actually happened, historically, every time: Chart violent crime over time, and the line doesn't change when the laws are passed. Not then, not later, not ever. Hundreds of experiments, all with the same result. Maybe it'll be different next time, but it's looking pretty unlikely by now. We absolutely agree with you that violence is bad. Where we differ is that we think failed approaches are best discarded. Society has a finite amount of time and effort to devote to the problem of reducing violent crime, so we should get our money's worth, and devote the resources we've got to approaches that have been shown to work -- or untried approaches that at least show some promise of working. I'd like to offer you a compromise: Respect the rights that I enjoy, as long as I can't be shown to be harming anybody by exercising them, and I'll keep right on defending your rights to freedom from religion, to reproductive choice, to speech, privacy, and all the rest. And I'll keep on advocating for everybody's freedom to marry whoever they like. I am in no position to making deals with anyone. We will have to agree to disagree Matthew. I have addressed your "facts" above and come to different conclusions. The "Valentines Day Massacre" that ended Prohibition was a total of seven deaths. The Virginia Tech shooting took place where firearms are totally banned for private citizens. Clearly we don't need to go back to the good old days, we just need to go to college. We have a club up here that owns a bunch of WW2 firearms. They hosted an event for the females of a local church to try shooting a bunch of historic WW2 firearms. By far the most popular was what appeared to be a Browning M1919. I remember seeing teenagers, moms, all sorts of women cracking huge grins as it went rat-a-tat. Nobody was hurt. Nobody wanted to shoot up the nearby burger burn. It was entirely safe and apparently very entertaining, judging by the big smiles and excited talk. I overheard women talking about how it was an empowering experience. It must have been awfully expensive, though... The 1919 fires 30-06 rounds, which cost about $1/each up here (even mil surplus from the CMP is pricey with the shipping limitations up here). I can't even imagine how expensive the firearm itself is. It must cost over ten grand! Competing in subgun matches (an awfully sporting purpose btw). Note that she's using a machine gun AND a suppressor (because people like to keep their hearing). "Nids" is awesome. She handled that subgun better than most guys I've seen. I think more hoplophobes and antis need to see more videos like that one. Somehow I doubt that she has an unhealthy fear of guns and shooting. Nids has learned a skill and has likely been empowered through that knowledge. I doubt she views herself as a potential "victim" of guns or gun crime. If you think a machine gun is too dangerous for civilians to own, why do you think we should be able to own handguns, rifles, and shotguns? A gun is a gun. One fires rapidly, another can be easily concealed, the third has a long accurate range, and the last one is incredibly powerful at short range. Why are you so sure that handguns, rifles, and shotguns should be available just because someone passed a background check? Are they really that much less dangerous than machine guns? Those are nonsensical questions to which you likely know the answers. That's no match for even the most basic deer rifle, yet the Tippmann requires all sorts of hoops to jump through and goes for about $15,000 - while people sell deer rifles at garage sales. The 1911 and Berretta 92 pistols, Mossberg, Winchester and Ithaca shotguns, 1903 bolt action rifle (and Remington 700 rifles still) and SR-25 are all "military" weapons that are treated no differently than any other civilian sporting arms as far as paperwork and background checks. They are all "implements of war" that were used or are still in use today. Why not machine guns? Probably pointless to ask again, but I'll try. Before 1986, we had a scheme where legal ownership of newly manufactured machine guns was allowed, but controlled tightly enough that there were only two crimes in 50 years. If that isn't good enough, what would be? It appears to me that if the record of legally owned machine guns is not good enough, there is no legal ownership of any gun that would meet your standards. So anonymous,above, you admit that assaut rifles are "implements of war". Interesting. Youmust be joking. Can a blog kill someone? Do you guys think you can be taken seriuosly when you make statements like that? And assault rifles are select fire weapons that have been banned from sale to civilians since 1986 (all select fire weapons are classified as machineguns by the ATF). My AR15 that you want to ban as an assault rifle is semi-auto only. So why do you want to ban my AR15? It has a legitimate civilian sporting use. As far as implements of war, the Miller decision noted that the militia component of the 2nd amendment gives the public a right to keep arms designed for war. And remember, that Remington 700 that is grandpa's deer rifle? In 308 and 300 Win Mag it is known as the M24 and M40 sniper rifles. Do you want to ban dangerous sniper rifles? You can't do that without also banning the most popular deer rifle in America. The Winchester M70, americas "other" bolt action rifle was also used as a sniper rifle by the Marine Corps. Even Ruger rifles have been used as implements of war by the US Military (mini14's used by NAVSPECWAR). So I do admit that guns have been used as "implements of war". It's hard to fight a modern war without guns. Heck, if we banned every weapon system ever used in war that would get rid of, longbows, crossbows, hunting spears, all knives, shotguns, flintlocks, rifled muskets aka "caplocks", matchlocks, bolt action rifles, lever action rifles, revolvers, semi auto pistols, semi-auto carbines, and semi-auto rifles. All of which are currently not classified as "implements of war" by the ATF. Can a blog kill someone? Well according to the proposed cyberbullying legislation in some states, yes. Keep those comments coming,anonymous. They get more ridiculous with each one. Can a blog kill someone? Do you guys think you can be taken seriuosly when you make statements like that? Dangerous ideas, via both the spoken and written word, have been responsible for more death, genocide, and general human misery than virtually anything else in the world. See Mein Kampf and The Communist Manifesto. Yes- agreed. But to equate regulating a blog with regulating a gun is just plain nonsense. Also, maybe you can add Glenn Beck to that list since there have been a number of recent cases of people who have shot others or attempted to who said they had been watching Glenn Beck and got some of their anti-governmentdeas from him. The Hughes ammendment never actually passed. If you watch the video of that session in the house the ammendment fails. Old Charlie Rangel was the chairman that day so maybe someone fiddled with the paperwork. It happened on his taxes.